Chaco Canyon - Super Inky! Autumn has been going really well so far! I've been having a hard time keeping up with blogging because I did some traveling. Last month, I went on a special trip to New Mexico with my Mama to visit my grandma! 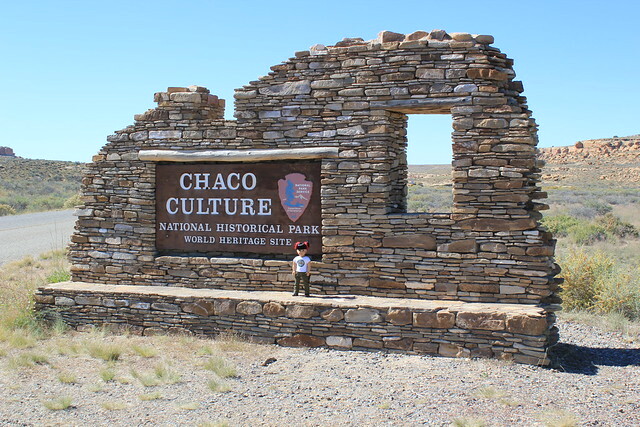 I was especially excited because we planned to visit a National Park I've always wanted to see- Chaco Culture National Historical Park. After stopping at the Vistor Center to pick up some trail guides, we headed out to our first hike. There are many different parts of Chaco Canyon- each one has something different to offer. To start, we went to Casa Rinconada. Casa Rinconada is a Great Kiva- a special ceremonial place where the ancestral Puebloans gathered. This particular kiva is really large- it could fit hundreds of people! It's one of the largest excavated kivas in the ancestral Puebloan world. As we walked around the Casa Rinconada path, we saw the remains of many other structures. 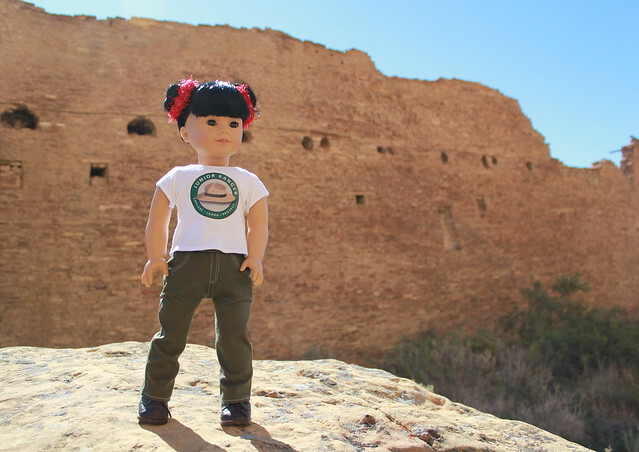 Imagine, a thousand years ago, Pueblo girls like me lived in Chaco Canyon. I know their life was very different than mine, but I'm sure in some ways it was just the same. 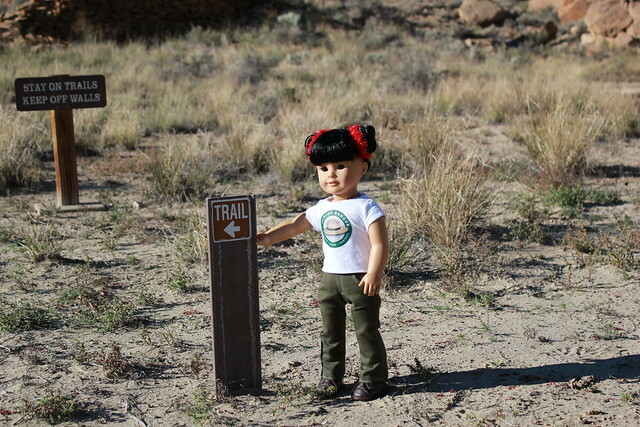 After we finished the Casa Rinconada trail, we headed to Pueblo Bonito. Pueblo Bonito, which means "beautiful town" (in Spanish) is the most thoroughly excavated area of Chaco Canyon. (Excavated means that archaeologists carefully dug through the area and made careful listings of everything they found.) The buildings are huge! In fact, when they were standing, they were even larger than the New York City apartment building I live in! Pueblo Bonito is so beautiful. 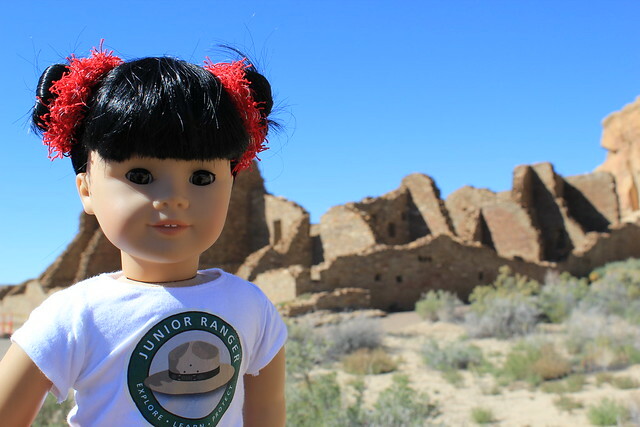 I tried to imagine what it was like when the ancestral Puebloans still lived in Chaco Canyon. Can you believe they built such a beautiful large city with no modern tools? Even the enormous logs for the roofs had to be carried from far away- but the ancestral Puebloans had no wheels or horses to help them. 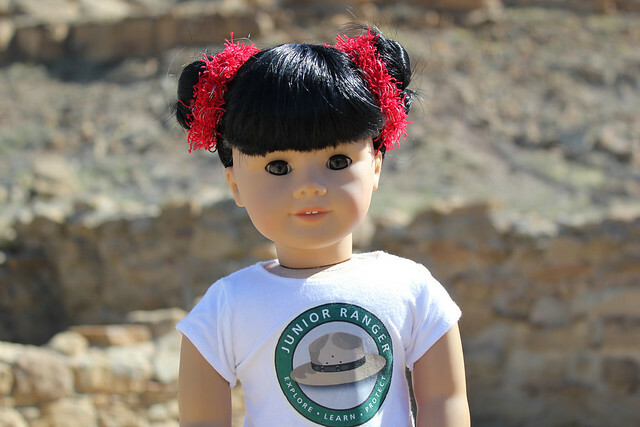 Of course, I had to participate in the Junior Ranger program at Chaco! I filled out a special booklet with questions about the park. I learned that archaeologists can tell how old some of the buildings are by looking at the way the ancestral Puebloans arranged the stones. Cool, right? Inside Pueblo Bonito, I found this beautiful series of doors. I have been to ancient ruins before, in Ukraine, but Chaco Canyon was so much more special to me- because it's where my family is from. My mama's family is descended from the very people who built these beautiful places. 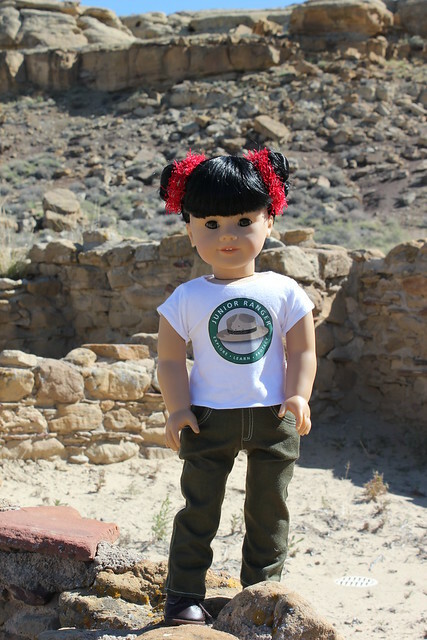 After we finished our Pueblo Bonito hike, I went back to the Visitor Center with Ranger Jane. 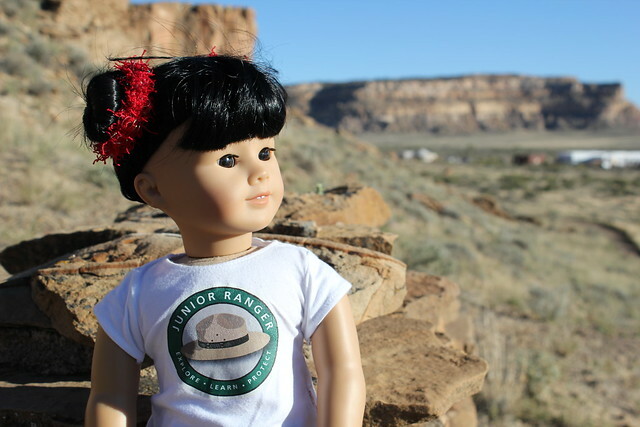 I told Ranger Jane that I want to be a park ranger when I grow up; she encouraged me to follow my dreams! She even told me about some special programs I can participate in to help me reach my goal. 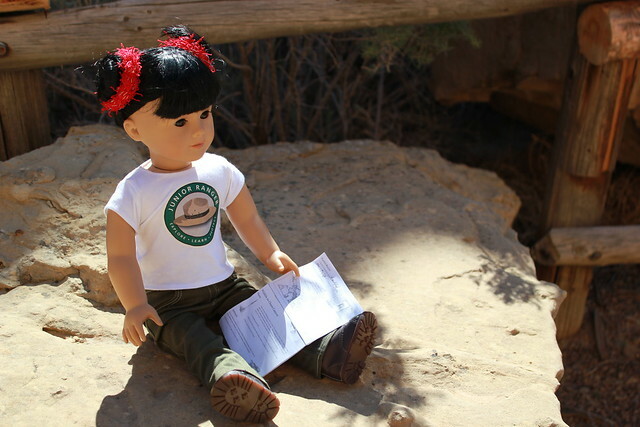 Being sworn in at Chaco Culture was my most special Junior Ranger program yet. I made Ranger Jane a promise that I would be back- I really want to bring Violet and Piper here some day! Our last hike of the day was to Una Vida, another series of buildings. As always, I made sure to stay on the trail. In our nation's parks, visitors must always remember to take only pictures, and leave only footsteps. 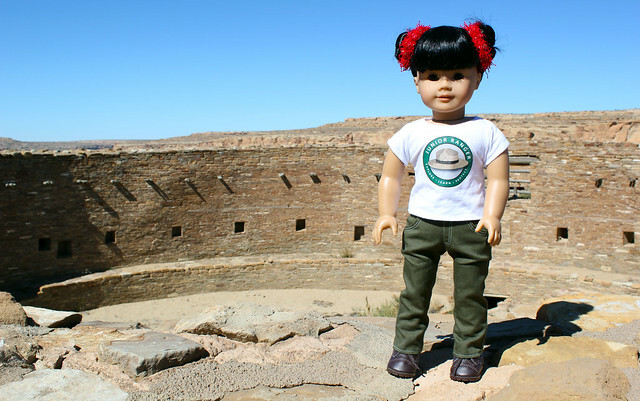 I want to be sure Chaco Canyon will always be preserved for future generations. As we neared the top of the canyon walls at Una Vida, I looked down over the canyon. I felt so happy that my family had brought me to Chaco Canyon. Before I left, I closed my eyes and said a special prayer in remembrance of my family's ancestors. Chaco Canyon is a very special place; I made myself promise that I would be back again someday. P.S. 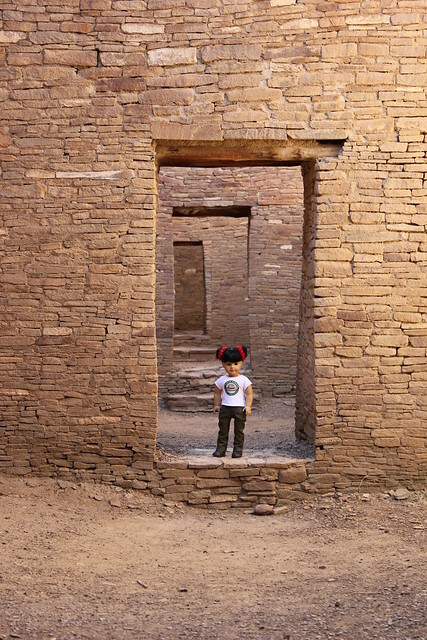 If you'd like to learn more about Chaco Culture National Historical Park, check out their excellent website. They have a special section just for kids! 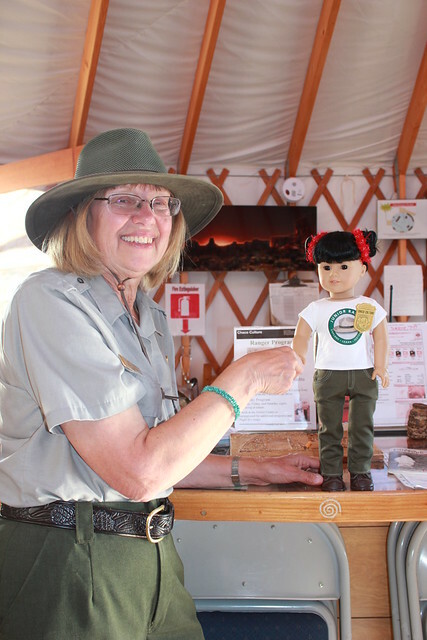 If you go to the park, make sure to stop by the Visitor Center to meet Ranger Jane! Say hello to her from me, Inky! Chaco Canyon seems like a beautiful National Park to visit! How very special it must have been for you to walk in your mama's ancestor's footsteps, too. Your mama is so very lucky to know so much about her heritage. Great photos! Thanks for including a link to learn more as well. Thanks for sharing your photos! Chaco Canyon looks muy bonito, if I do say so myself. It would be cool to visit someday. I was wondering how big do you make your pictures? P.S. Your hair looks super cute that way! Privet, Inky! It's super pretty there! Thanks for sharing your pictures with us! Hi Inky, I really love your blog. I have read the whole thing. I am really interested in your visits to the National Parks. My grandpa was a Park Ranger. He worked in many parks. My Mom grew up in many National Parks in the Southwest but she says she never made it to Chaco Canyon. Thanks for sharing your wonderful adventures with us.